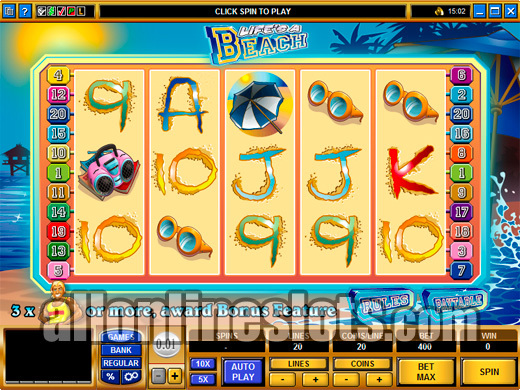 Life's a Beach is a summer theme video slot with a pick a box bonus game. It uses the popular 5 reel, 20 line format and has a max bet of 20 coins per line. Top jackpot is 12,000 coins and each pick on the bonus can award 100X your bet. The Australian style video slots made by companies such as Aristocrat have become very popular all over the world. 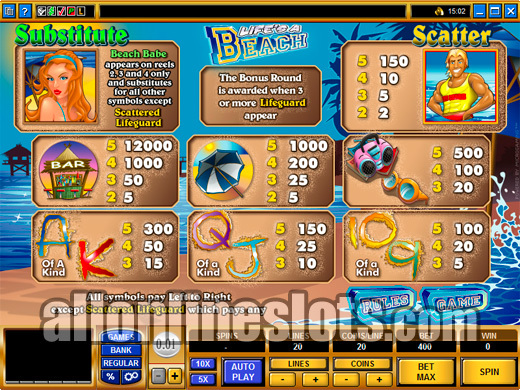 Life's a Beach is a tribute to these games with an Australian beach theme. As with many of the Aristocrat slots it is a five reel, 20 line slot game with a bonus feature. Life's a Beach has a high top jackpot of 12,000 coins which is won by hitting five of the Bar (the drinking type not the rectangle) on any active line. This jackpot can be multiplied by up to 20 ad you can select to play between one and twenty coins per line. At max bet the jackpot pays a big 240,000 coins. Other symbols on the reels include regular sights seen at the beach such as a girl in a bikini, sunglasses and umbrellas. Like most of the Australian style slots you also have the playing card symbols 9, 10, J, Q, K and A which make up all of the lower paying winning combinations. The pick a box style bonus game is reached by hitting three , four or five lifeguard symbols. The lifeguard is scattered so you can hit the symbols anywhere on the reels. Once activated you move on to the second screen stage where you will see a group six umbrellas (View Screenshot). You get to pick four of the six with the aim of finding a beach girl under each umbrella. If you pick an umbrella where there is no beach girl you win a consolation prize of two times your total bet. If you pick an umbrella with a beach girl you can win up to 100 times your bet. Life's a Beach is a great game to play if you are a fan of the pick a box bonus. We would have liked to see a free spin feature as well but even without any free spins the game does offer jackpots of up to 240,000 coins.